The south-west region is here defined as being the areas either to the south of Hobart or to the west of the first line from Oatlands-Brighton. The line from Green Ponds to Bothwell was a priority and Telegraph Offices were opened in both places in 1865 or before. 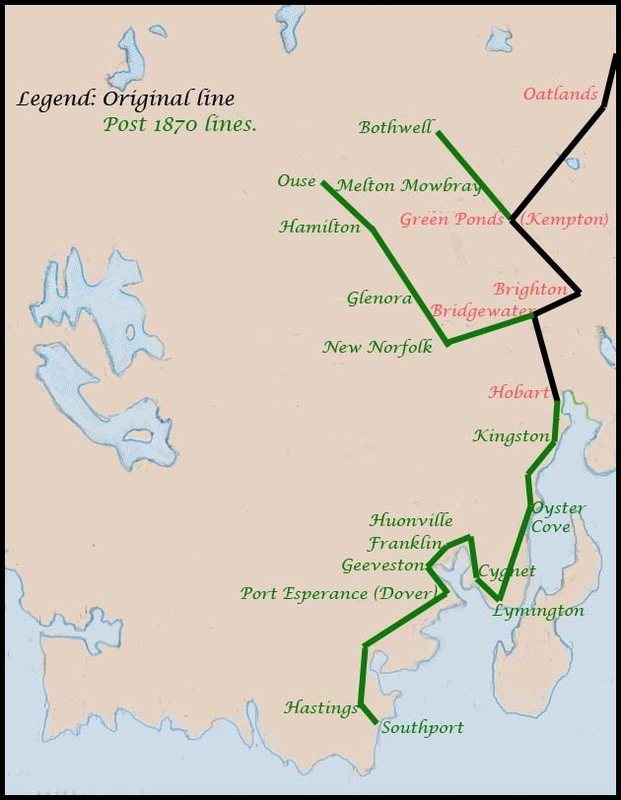 The line from Bridgewater to New Norfolk was constructed about 1871 and then extended from New Norfolk to Hamilton in 1872. The line to Ouse was completed in 1876 and a second line from Hobart via Ouse to Strahan was commenced in 1890. This was a difficult construction activity. Nearly half way to Queenstown, an office was opened at Dee in 1892. An intermediate station at Glenora opened 1885. New Norfolk was an important area with which to communicate - partly because of the large numbers of settlers from Norfolk Island but also because a centre for invalid and sick convicts had been opened there in 1827. Other Telegraph Offices opened in this area either on existing lines or on short extension lines include Millbury and Ederslie (1891) and Fenton (1897). A number The nature of the terrain in the Huon area dictated that telegraph lines could be more easily and economically constructed by following the coastal route to Cygnet and then up to Geeveston and down again along the coastal route to Southport. Southport was an important contact point for the Government being the most southerly centre in Tasmania but also because it was a busy port for whaling and sealers and shipping for timber. The Telegraph Office opened there in 1879. Telegraph Offices were opened as required along the Huon line. Geeve's Town was completed by the end of 1878. An office opened in Port Esperance (Dover) in 1879 and the line was extended to Southport in the same year. The line to Hastings was completed in 1880. Other offices opened in the mid-1880s or after as demand grew. For example Ranelagh Junction and Rocky River (close to each other) were both opened above Huonville in 1900.